Aimed at climbers who are serious about their bouldering, the Moon Warrior Crash Pad is heavy-duty mat that's lightweight, easy to carry and full of handy features to make your bouldering experience easier. It features a one-piece 'taco'-style design, meaning there are no fold points or empty space for you to land in, while the combination of open and closed cell foam will keep you protected if you fall. The Warrior also features an innovative carry system; it has padded backpack straps and a waist belt and chest strap for mega easy transportation, which can be covered with a protective flap that doubles as a shoe cleaner when you're climbing. Along with reinforced corners and a non slip base, the Warrior is designed to fold with the dirty side on the inside so you don't traipse mud and dust through your house and car - all in all, a super-protective, high-functioning bouldering pad, that cares about keeping you clean. The Moon Warrior Crash Pad is made up of 9.5cm of open cell foam sandwiched between two sheets of 2.5cm closed cell foam for optimal protection and impact absorption properties, whatever distance you're falling from. 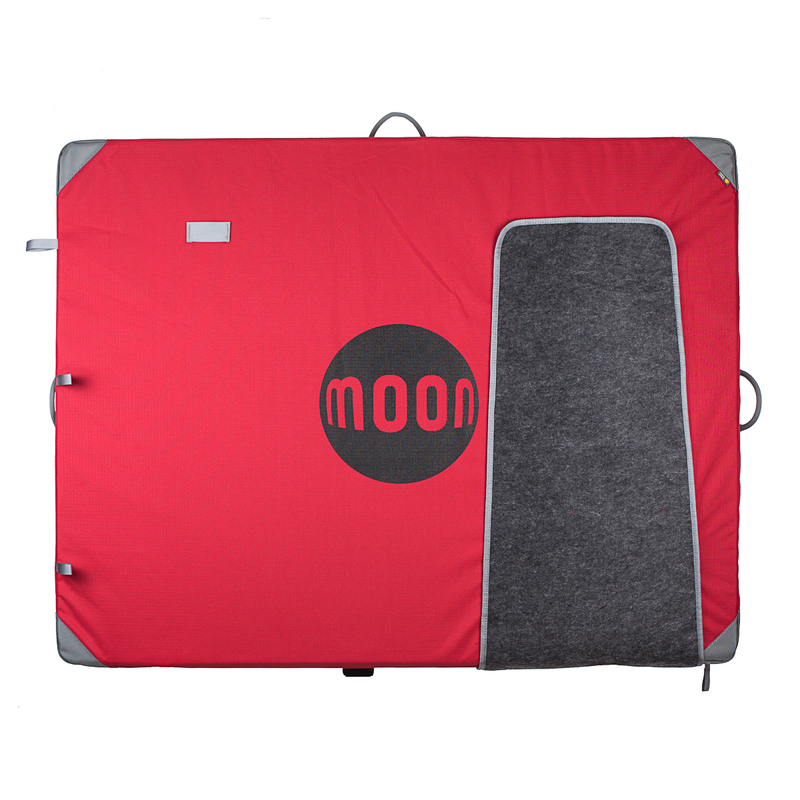 The Moon Warrior Crash Pad comes with a handy foot wipe mat that covers the shoulder straps while you're climbing and can then be folded around the bottom of the pad when you want to carry it away. This means the bottom of the pad is closed off so you can use it to carry any extra gear. The padded backpack straps are adjustable and include a wait belt that can easily be folded away when you're not using it, and the carry handles at the top and side of the pad mean you can carry it easily between problems. Moon's Warrior Crash Pad is coated in ultra hard-wearing ballistic nylon fabric for the best abrasion resistance, complete with a non-slip base and reinforced corners so the mat stays in place. It also features lightweight aluminium buckles and padded shoulder straps. Furthermore, the foam is wrapped in plastic to give the pad some water resistance if it's dropped in a puddle or rain finishes play. Buying a bouldering pad is a big scary investment, and no one wants to be fooled into paying too much, nor fooled into paying too little and ending up with an ankle breaking product. Carry system - This is genius on the warrior... The large carpet area totally covers the rucksack straps while in use, making for a sleek and useful look and function. To convert to carry mode, the carpet is pulled up off the burly velcro, and the mat folded with the underside facing inwards to avoid soiling your car. The carpet attaches to the back side of the mat, preventing your bits and bobs from falling out of the folded mat. Carry system is super comfortable thanks to the hip belt and chest strap making the mat feel incredibly light. Grippy underside - two black rubberised strips on the underside of the mat mean that it is much more resistant to slipping on slopey ground. This has worked really well when I've needed it. Encased foam - The 2 layers of foam inside the mat are encased in what is basically a giant (removable) tough plastic bag. A crinkle sound is just noticeable when stepping on the mat, but I've not found it to be irritating. The benefit of this plastic bag is that it protects the foam from moisture, which is inevitable in the life of a bouldering mat. Moisture and mould can of course contribute to the degradation of the foam, shortening the life of the mat. With this mat however, worry not if you get caught in a thunderstorm while at the crag, because this mat looks after itself. Needless to say, foam quality is reassuring, build quality bomber and fabric burly. Chuffed with this mat. On top of that, epictv offered the best price on the Internet, and shipped it for free all the way to me in Spain... Heroes. Thanks very much! I’ve borrowed this crash pad many times from friends and now finally I have my own! It’s so nice to use. Dirty side stays in when folded. Bit stiff when new, but will break in and stays decent over time. The usability and overall design is user friendly and importantly the padding is more than adequate.